"You get a red line, you get a red line, everyone gets a red line..."
Beware The Dogs Of War: Is The American Empire On The Verge Of Collapse? Waging endless wars abroad (in Iraq, Afghanistan, Pakistan and now Syria) isn’t making America—or the rest of the world—any safer, it’s certainly not making America great again, and it’s undeniably digging the U.S. deeper into debt. In fact, it’s a wonder the economy hasn’t collapsed yet. Indeed, even if we were to put an end to all of the government’s military meddling and bring all of the troops home today, it would take decades to pay down the price of these wars and get the government’s creditors off our backs. Even then, government spending would have to be slashed dramatically and taxes raised. The government is $19 trillion in debt. The Pentagon’s annual budget consumes almost 100% of individual income tax revenue. The government has spent $4.8 trillion on wars abroad since 9/11, with $7.9 trillion in interest. As the Atlantic points out, we’re fighting terrorism with a credit card. The government lost more than $160 billion to waste and fraud by the military and defense contractors. Taxpayers are being forced to pay $1.4 million per hour to provide U.S. weapons to countries that can’t afford them. 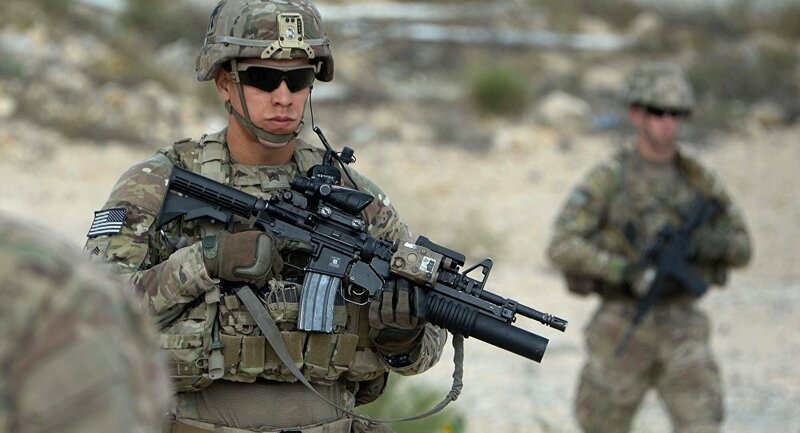 The U.S. government spends more on wars (and military occupations) abroad every year than all 50 states combined spend on health, education, welfare, and safety. Now President Trump wants to increase military spending by $54 billion. Add in the cost of waging war in Syria, and the burden on taxpayers soars to more than $11.5 million a day. Ironically, while presidential candidate Trump was vehemently opposed to the U.S. use of force in Syria, and warned that fighting Syria would signal the start of World War III against a united Syria, Russia and Iran, he wasted no time launching air strikes against Syria. Clearly, war has become a huge money-making venture, and the U.S. government, with its vast military empire, is one of its best buyers and sellers. Yet what most Americans—brainwashed into believing that patriotism means supporting the war machine—fail to recognize is that these ongoing wars have little to do with keeping the country safe and everything to do with enriching the military industrial complex at taxpayer expense. The rationale may keep changing for why American military forces are in Afghanistan, Iraq, Pakistan and now Syria. However, the one that remains constant is that those who run the government—including the current president—are feeding the appetite of the military industrial complex and fattening the bank accounts of its investors. Case in point: President Trump plans to “beef up” military spending while slashing funding for the environment, civil rights protections, the arts, minority-owned businesses, public broadcasting, Amtrak, rural airports and interstates. In other words, in order to fund this burgeoning military empire that polices the globe, the U.S. government is prepared to bankrupt the nation, jeopardize our servicemen and women, increase the chances of terrorism and blowback domestically, and push the nation that much closer to eventual collapse. Obviously, our national priorities are in desperate need of an overhauling. $270 billion to repair U.S. public schools, and twice that much to modernize them. $120 billion a year to fix the nation’s crumbling infrastructure. $251 million for safety improvements and construction for Amtrak. $690 million to care for America’s 70,000 aging veterans. $11 billion wasted or lost in Iraq in just one year could have paid 220,000 teachers’ salaries. The yearly cost of stationing just one soldier in Iraq could have fed 60 American families. $30 billion per year to end starvation and hunger around the world. $11 billion per year to provide the world—including our own failing cities—with clean drinking water. Use the $10 billion spent every year to provide arms, equipment, training and advice internationally to more than 180 countries to start paying down the overwhelming $19 trillion national debt. As long as “we the people” continue to allow the government to wage its costly, meaningless, endless wars abroad, the American homeland will continue to suffer: our roads will crumble, our bridges will fail, our schools will fall into disrepair, our drinking water will become undrinkable, our communities will destabilize, and crime will rise. Here’s the kicker, though: if the American economy collapses—and with it the last vestiges of our constitutional republic—it will be the government and its trillion-dollar war budgets that are to blame. Eventually, as I make clear in my book Battlefield America: The War on the American People, all military empires fail. More than 50 years ago, President Dwight Eisenhower warned us not to let the military industrial complex endanger our liberties or democratic processes. We failed to heed his warning. Every gun that is made, every warship launched, every rocket fired signifies, in the final sense, a theft from those who hunger and are not fed, those who are cold and are not clothed. This world in arms is not spending money alone. It is spending the sweat of its laborers, the genius of its scientists, the hopes of its children... This is not a way of life at all, in any true sense. Under the cloud of threatening war, it is humanity hanging from a cross of iron. Wake up, America. There’s not much time left before we reach the zero hour. Source: Beware The Dogs Of War: Is The American Empire On The Verge Of Collapse? Et bien sur !, vous pensez que les américains sont les gentils. But we must continue our efforts to develop understanding and compassion in the world. Hopefully, this article will assist in doing that by addressing the question “How many September 11ths has the United States caused in other nations since WWII?” This theme is developed in this report which contains an estimated numbers of such deaths in 37 nations as well as brief explanations of why the U.S. is considered culpable. The causes of wars are complex. In some instances nations other than the U.S. may have been responsible for more deaths, but if the involvement of our nation appeared to have been a necessary cause of a war or conflict it was considered responsible for the deaths in it. In other words they probably would not have taken place if the U.S. had not used the heavy hand of its power. The military and economic power of the United States was crucial. This study reveals that U.S. military forces were directly responsible for about 10 to 15 million deaths during the Korean and Vietnam Wars and the two Iraq Wars. The Korean War also includes Chinese deaths while the Vietnam War also includes fatalities in Cambodia and Laos. The American public probably is not aware of these numbers and knows even less about the proxy wars for which the United States is also responsible. In the latter wars there were between nine and 14 million deaths in Afghanistan, Angola, Democratic Republic of the Congo, East Timor, Guatemala, Indonesia, Pakistan and Sudan. But the victims are not just from big nations or one part of the world. The remaining deaths were in smaller ones which constitute over half the total number of nations. Virtually all parts of the world have been the target of U.S. intervention. The overall conclusion reached is that the United States most likely has been responsible since WWII for the deaths of between 20 and 30 million people in wars and conflicts scattered over the world. To the families and friends of these victims it makes little difference whether the causes were U.S. military action, proxy military forces, the provision of U.S. military supplies or advisors, or other ways, such as economic pressures applied by our nation. They had to make decisions about other things such as finding lost loved ones, whether to become refugees, and how to survive. And the pain and anger is spread even further. Some authorities estimate that there are as many as 10 wounded for each person who dies in wars. Their visible, continued suffering is a continuing reminder to their fellow countrymen. It is essential that Americans learn more about this topic so that they can begin to understand the pain that others feel. Someone once observed that the Germans during WWII “chose not to know.” We cannot allow history to say this about our country. The question posed above was “How many September 11ths has the United States caused in other nations since WWII?” The answer is: possibly 10,000. Generally speaking, the much smaller number of Americans who have died is not included in this study, not because they are not important, but because this report focuses on the impact of U.S. actions on its adversaries. An accurate count of the number of deaths is not easy to achieve, and this collection of data was undertaken with full realization of this fact. These estimates will probably be revised later either upward or downward by the reader and the author. But undoubtedly the total will remain in the millions. The difficulty of gathering reliable information is shown by two estimates in this context. For several years I heard statements on radio that three million Cambodians had been killed under the rule of the Khmer Rouge. However, in recent years the figure I heard was one million. Another example is that the number of persons estimated to have died in Iraq due to sanctions after the first U.S. Iraq War was over 1 million, but in more recent years, based on a more recent study, a lower estimate of around a half a million has emerged. Both victorious and defeated nations may have their own reasons for underreporting the number of deaths. Further, in recent wars involving the United States it was not uncommon to hear statements like “we do not do body counts” and references to “collateral damage” as a euphemism for dead and wounded. Life is cheap for some, especially those who manipulate people on the battlefield as if it were a chessboard. To say that it is difficult to get exact figures is not to say that we should not try. Effort was needed to arrive at the figures of 6six million Jews killed during WWI, but knowledge of that number now is widespread and it has fueled the determination to prevent future holocausts. That struggle continues. The Soviet Union had friendly relations its neighbor, Afghanistan, which had a secular government. The Soviets feared that if that government became fundamentalist this change could spill over into the Soviet Union. An indigenous armed struggle against Portuguese rule in Angola began in 1961. In 1977 an Angolan government was recognized by the U.N., although the U.S. was one of the few nations that opposed this action. In 1986 Uncle Sam approved material assistance to UNITA, a group that was trying to overthrow the government. Even today this struggle, which has involved many nations at times, continues. Hugo Banzer was the leader of a repressive regime in Bolivia in the 1970s. The U.S. had been disturbed when a previous leader nationalized the tin mines and distributed land to Indian peasants. Later that action to benefit the poor was reversed. Banzer, who was trained at the U.S.-operated School of the Americas in Panama and later at Fort Hood, Texas, came back from exile frequently to confer with U.S. Air Force Major Robert Lundin. In 1971 he staged a successful coup with the help of the U.S. Air Force radio system. In the first years of his dictatorship he received twice as military assistance from the U.S. as in the previous dozen years together. U.S. bombing of Cambodia had already been underway for several years in secret under the Johnson and Nixon administrations, but when President Nixon openly began bombing in preparation for a land assault on Cambodia it caused major protests in the U.S. against the Vietnam War. There is little awareness today of the scope of these bombings and the human suffering involved. Immense damage was done to the villages and cities of Cambodia, causing refugees and internal displacement of the population. This unstable situation enabled the Khmer Rouge, a small political party led by Pol Pot, to assume power. Over the years we have repeatedly heard about the Khmer Rouge’s role in the deaths of millions in Cambodia without any acknowledgement being made this mass killing was made possible by the the U.S. bombing of that nation which destabilized it by death , injuries, hunger and dislocation of its people. Human Rights Watch claimed that Habre was responsible for thousands of killings. In 2001, while living in Senegal, he was almost tried for crimes committed by him in Chad. However, a court there blocked these proceedings. Then human rights people decided to pursue the case in Belgium, because some of Habre’s torture victims lived there. The U.S., in June 2003, told Belgium that it risked losing its status as host to NATO’s headquarters if it allowed such a legal proceeding to happen. So the result was that the law that allowed victims to file complaints in Belgium for atrocities committed abroad was repealed. However, two months later a new law was passed which made special provision for the continuation of the case against Habre. The CIA intervened in Chile’s 1958 and 1964 elections. In 1970 a socialist candidate, Salvador Allende, was elected president. The CIA wanted to incite a military coup to prevent his inauguration, but the Chilean army’s chief of staff, General Rene Schneider, opposed this action. The CIA then planned, along with some people in the Chilean military, to assassinate Schneider. This plot failed and Allende took office. President Nixon was not to be dissuaded and he ordered the CIA to create a coup climate: “Make the economy scream,” he said. China An estimated 900,000 Chinese died during the Korean War. For more information, See: Korea. In recent years the U.S. government has provided assistance under Plan Colombia. The Colombian government has been charged with using most of the funds for destruction of crops and support of the paramilitary group. In the Bay of Pigs invasion of Cuba on April 18, 1961 which ended after 3 days, 114 of the invading force were killed, 1,189 were taken prisoners and a few escaped to waiting U.S. ships. (1) The captured exiles were quickly tried, a few executed and the rest sentenced to thirty years in prison for treason. These exiles were released after 20 months in exchange for $53 million in food and medicine. In 1960 the Congo became an independent state with Patrice Lumumba being its first prime minister. He was assassinated with the CIA being implicated, although some say that his murder was actually the responsibility of Belgium. (3) But nevertheless, the CIA was planning to kill him. (4) Before his assassination the CIA sent one of its scientists, Dr. Sidney Gottlieb, to the Congo carrying “lethal biological material” intended for use in Lumumba’s assassination. This virus would have been able to produce a fatal disease indigenous to the Congo area of Africa and was transported in a diplomatic pouch. The CIA began to destabilize Grenada in 1979 after Maurice Bishop became president, partially because he refused to join the quarantine of Cuba. The campaign against him resulted in his overthrow and the invasion by the U.S. of Grenada on October 25, 1983, with about 277 people dying. (1,2) It was fallaciously charged that an airport was being built in Grenada that could be used to attack the U.S. and it was also erroneously claimed that the lives of American medical students on that island were in danger. In 1951 Jacobo Arbenz was elected president of Guatemala. He appropriated some unused land operated by the United Fruit Company and compensated the company. (1,2) That company then started a campaign to paint Arbenz as a tool of an international conspiracy and hired about 300 mercenaries who sabotaged oil supplies and trains. (3) In 1954 a CIA-orchestrated coup put him out of office and he left the country. During the next 40 years various regimes killed thousands of people. From 1957 to 1986 Haiti was ruled by Papa Doc Duvalier and later by his son. During that time their private terrorist force killed between 30,000 and 100,000 people. (1) Millions of dollars in CIA subsidies flowed into Haiti during that time, mainly to suppress popular movements, (2) although most American military aid to the country, according to William Blum, was covertly channeled through Israel. Reportedly, governments after the second Duvalier reign were responsible for an even larger number of fatalities, and the influence on Haiti by the U.S., particularly through the CIA, has continued. The U.S. later forced out of the presidential office a black Catholic priest, Jean Bertrand Aristide, even though he was elected with 67% of the vote in the early 1990s. The wealthy white class in Haiti opposed him in this predominantly black nation, because of his social programs designed to help the poor and end corruption. (3) Later he returned to office, but that did not last long. He was forced by the U.S. to leave office and now lives in South Africa. Iran lost about 262,000 people in the war against Iraq from 1980 to 1988. (1) See Iraq for more information about that war. According to Howard Teicher, a former National Security Council official, the U.S. provided the Iraqis with billions of dollars in credits and helped Iraq in other ways such as making sure that Iraq had military equipment including biological agents This surge of help for Iraq came as Iran seemed to be winning the war and was close to Basra. (1) The U.S. was not adverse to both countries weakening themselves as a result of the war, but it did not appear to want either side to win. B: The U.S.-Iraq War and the Sanctions Against Iraq extended from 1990 to 2003. Iraq invaded Kuwait on August 2, 1990 and the U.S. responded by demanding that Iraq withdraw, and four days later the U.N. levied international sanctions. Iraq had reason to believe that the U.S. would not object to its invasion of Kuwait, since U.S. Ambassador to Iraq, April Glaspie, had told Saddam Hussein that the U.S. had no position on the dispute that his country had with Kuwait. So the green light was given, but it seemed to be more of a trap. As a part of the public relations strategy to energize the American public into supporting an attack against Iraq the daughter of the Kuwaiti ambassador to the U.S. falsely testified before Congress that Iraqi troops were pulling the plugs on incubators in Iraqi hospitals. (1) This contributed to a war frenzy in the U.S.
Other deaths later were from delayed deaths due to wounds, civilians killed, those killed by effects of damage of the Iraqi water treatment facilities and other aspects of its damaged infrastructure and by the sanctions. However, there are limitations to his study. His figures were not updated for the remaining three years of the sanctions. Also, two other somewhat vulnerable age groups were not studied: young children above the age of five and the elderly. All of these reports were considerable indicators of massive numbers of deaths which the U.S. was aware of and which was a part of its strategy to cause enough pain and terror among Iraqis to cause them to revolt against their government. Just as the end of the Cold War emboldened the U.S. to attack Iraq in 1991 so the attacks of September 11, 2001 laid the groundwork for the U.S. to launch the current war against Iraq. While in some other wars we learned much later about the lies that were used to deceive us, some of the deceptions that were used to get us into this war became known almost as soon as they were uttered. There were no weapons of mass destruction, we were not trying to promote democracy, we were not trying to save the Iraqi people from a dictator. Since these deaths are a result of the U.S. invasion, our leaders must accept responsibility for them. John H. Kim, a U.S. Army veteran and the Chair of the Korea Committee of Veterans for Peace, stated in an article that during the Korean War “the U.S. Army, Air Force and Navy were directly involved in the killing of about three million civilians – both South and North Koreans – at many locations throughout Korea…It is reported that the U.S. dropped some 650,000 tons of bombs, including 43,000 tons of napalm bombs, during the Korean War.” It is presumed that this total does not include Chinese casualties. U.S. military intervention in Laos actually began much earlier. A civil war started in the 1950s when the U.S. recruited a force of 40,000 Laotians to oppose the Pathet Lao, a leftist political party that ultimately took power in 1975. But ways were found to get around this prohibition. The National Security Council, which was not explicitly covered by the law, raised private and foreign funds for the Contras. In addition, arms were sold to Iran and the proceeds were diverted from those sales to the Contras engaged in the insurgency against the Sandinista government. (5) Finally, the Sandinistas were voted out of office in 1990 by voters who thought that a change in leadership would placate the U.S., which was causing misery to Nicaragua’s citizenry by it support of the Contras. Since 1955, when it gained its independence, Sudan has been involved most of the time in a civil war. Until about 2003 approximately 2 million people had been killed. It not known if the death toll in Darfur is part of that total. Human rights groups have complained that U.S. policies have helped to prolong the Sudanese civil war by supporting efforts to overthrow the central government in Khartoum. In 1999 U.S. Secretary of State Madeleine Albright met with the leader of the Sudan People’s Liberation Army (SPLA) who said that she offered him food supplies if he would reject a peace plan sponsored by Egypt and Libya. In 1978 the vastness of Sudan’s oil reservers was discovered and within two years it became the sixth largest recipient of U.S, military aid. It’s reasonable to assume that if the U.S. aid a government to come to power it will feel obligated to give the U.S. part of the oil pie. A British group, Christian Aid, has accused foreign oil companies of complicity in the depopulation of villages. These companies – not American – receive government protection and in turn allow the government use of its airstrips and roads. During that war an American assassination operation,called Operation Phoenix, terrorized the South Vietnamese people, and during the war American troops were responsible in 1968 for the mass slaughter of the people in the village of My Lai. Since deaths in Cambodia and Laos were about 2.7 million (See Cambodia and Laos) the estimated total for the Vietnam War is 7.8 million. Yugoslavia was a socialist federation of several republics. Since it refused to be closely tied to the Soviet Union during the Cold War, it gained some suport from the U.S. But when the Soviet Union dissolved, Yugoslavia’s usefulness to the U.S. ended, and the U.S and Germany worked to convert its socialist economy to a capitalist one by a process primarily of dividing and conquering. There were ethnic and religious differences between various parts of Yugoslavia which were manipulated by the U.S. to cause several wars which resulted in the dissolution of that country. 1.Mark Zepezauer, Boomerang (Monroe, Maine: Common Courage Press, 2003), p.135. 2.Angolan Update, American Friends Service Committee FS, 11/1/99 flyer. 3.Norman Solomon, War Made Easy, (John Wiley & Sons, 2005) p. 82-83. 5. Jeffress Ramsay, Africa , (Dushkin/McGraw Hill Guilford Connecticut), 1997, p. 144-145. 6.Mark Zepezauer, The CIA’S Greatest Hits (Monroe, Maine: Common Courage Press, 1994), p.54. 2.Jerry Meldon, Return of Bolilvia’s Drug – Stained Dictator, Consortium,www.consortiumnews.com/archives/story40.html. 1.Virtual Truth Commissiion http://www.geocities.com/~virtualtruth/ . 2.David Model, President Richard Nixon, Henry Kissinger, and the Bombing of Cambodia excerpted from the book Lying for Empire How to Commit War Crimes With A Straight Face, Common Courage Press, 2005, paperhttp://thirdworldtraveler.com/American_Empire/Nixon_Cambodia_LFE.html. 3.Noam Chomsky, Chomsky on Cambodia under Pol Pot, etc.,http//zmag.org/forums/chomcambodforum.htm. 1.William Blum, Rogue State (Monroe, Maine: Common Courage Press, 2000), p. 151-152 . 2.Richard Keeble, Crimes Against Humanity in Chad, Znet/Activism 12/4/06http://www.zmag.org/content/print_article.cfm?itemID=11560&sectionID=1). 1.Parenti, Michael, The Sword and the Dollar (New York, St. Martin’s Press, 1989) p. 56. 2.William Blum, Rogue State (Monroe, Maine: Common Courage Press, 2000), p. 142-143. 5.Chalmers Johnson, Blowback, The Costs and Consequences of American Empire (New York: Henry Holt and Company, 2000), p. 18. 2.William Blum, Rogue State (Monroe, Maine: Common Courage Press, 2000), p. 163. 4.Gabriella Gamini, CIA Set Up Death Squads in Colombia Times Newspapers Limited, Dec. 5, 1996,www.edu/CommunicationsStudies/ben/news/cia/961205.death.html). Human Rights Watch Report: Colombia’s Killer Networks–The Military-Paramilitary Partnership). 1.St. James Encyclopedia of Popular Culture – on Bay of Pigs Invasionhttp://bookrags.com/Bay_of_Pigs_Invasion. 4.William Blum, Killing Hope (Monroe, Maine: Common Courage Press, 1995), p 158-159. 3.William Blum, Killing Hope (Monroe, Maine: Common Courage Press, 1995), p. 175. 4.Mark Zepezauer, The CIA’S Greatest Hits (Monroe, Maine: Common Courage Press, 1994), p.26-27. 4.William Blum, Killing Hope (Monroe, Maine: Common Courage Press, 1995), p. 197. 1.Robert T. Buckman, Latin America 2003, (Stryker-Post Publications Baltimore 2003) p. 152-153. 2.William Blum, Rogue State (Monroe, Maine: Common Courage Press, 2000), p. 54-55. 1.Mark Zepezauer, The CIA’S Greatest Hits (Monroe, Maine: Common Courage Press, 1994), p. 66-67. 2.Stephen Zunes, The U.S. Invasion of Grenada,http://wwwfpif.org/papers/grenada2003.html . 3.Mark Zepezauer, The CIA’S Greatest Hits (Monroe, Maine: Common Courage Press, 1994), p.2-13. 4.Robert T. Buckman, Latin America 2003 (Stryker-Post Publications Baltimore 2003) p. 162. 2.Mark Zepezauer, The CIA’S Greatest Hits (Monroe, Maine: Common Courage Press, 1994), p 87. 1.William Blum, Rogue State (Monroe, Maine: Common Courage Press, 2000), p. 55. 3.James A. Lucas, Torture Gets The Silence Treatment, Countercurrents, July 26, 2004. 4.Gary Cohn and Ginger Thompson, Unearthed: Fatal Secrets, Baltimore Sun, reprint of a series that appeared June 11-18, 1995 in Jack Nelson-Pallmeyer, School of Assassins, p. 46 Orbis Books 2001. 2.Editorial, Indonesia’s Killers, The Nation, March 30, 1998. 3.Matthew Jardine, Indonesia Unraveling, Non Violent Activist Sept–Oct, 1997 (Amnesty) 2/7/07. 6.Peter Dale Scott, The United States and the Overthrow of Sukarno, 1965-1967, Pacific Affairs, 58, Summer 1985, pages 239-264.http://www.namebase.org/scott. 7.Mark Zepezauer, The CIA’S Greatest Hits (Monroe, Maine: Common Courage Press, 1994), p.30. 1.Geoff Simons, Iraq from Sumer to Saddam, 1996, St. Martins Press, NY p. 317. 2.Chronology of American State Terrorismhttp://www.intellnet.org/resources/american_terrorism/ChronologyofTerror.html. 2.Global Security.Org , Iran Iraq War (1980-1980)globalsecurity.org/military/world/war/iran-iraq.htm. 4.Anthony Arnove, Iraq Under Siege, (South End Press Cambridge MA 2000). p. 175. 6.Anthony Arnove, Iraq Under Siege, South End Press Cambridge MA 2000. p. 61. 7.David Cortright, A Hard Look at Iraq Sanctions December 3, 2001, The Nation. 3.Kanako Tokuno, Chinese Winter Offensive in Korean War – the Debacle of American Strategy, ICE Case Studies Number 186, May, 2006http://www.american.edu/ted/ice/chosin.htm. 3.Wayne Madsen, Possible CIA Hand in the Murder of the Nepal Royal Family, India Independent Media Center, September 25, 2001http://india.indymedia.org/en/2002/09/2190.shtml. 1.John G. Stoessinger, Why Nations Go to War, (New York: St. Martin’s Press), 1974 pp 157-172. 3.Mark Zepezauer, Boomerang (Monroe, Maine: Common Courage Press, 2003), p.123, 124. 5.Leo Kuper, Genocide (Yale University Press, 1981), p. 79. 1.Mark Zepezauer, The CIA’s Greatest Hits, (Odonian Press 1998) p. 83. 2.William Blum, Rogue State (Monroe, Maine: Common Courage Press, 2000), p.154. 4.Mark Zepezauer, CIA’S Greatest Hits (Monroe, Maine: Common Courage Press, 1994), p.83. 1.Romeo T. Capulong, A Century of Crimes Against the Filipino People, Presentation, Public Interest Law Center, World Tribunal for Iraq Trial in New York City on August 25,2004. 2.Roland B. Simbulan The CIA in Manila – Covert Operations and the CIA’s Hidden Hisotry in the Philippines Equipo Nizkor Information – Derechos, derechos.org/nizkor/filipinas/doc/cia. 1.John Dinges, Pulling Back the Veil on Condor, The Nation, July 24, 2000. 1.Mark Zepezauer, Boomerang, (Monroe, Maine: Common Courage Press, 2003), p. 30, 32,34,36. 2.The Black Commentator, Africa Action The Tale of Two Genocides: The Failed US Response to Rwanda and Darfur, 11 August 2006http://www.truthout.org/docs_2006/091706X.shtml. 7.Human Rights Watch, New Figures on Civilian Deaths in Kosovo War, (February 7, 2000) http://www.hrw.org/press/2000/02/nato207.htm. Paul elaborates that the reason for the attack has “nothing to do” with concern about the Syria government’s purported use of chemical weapons to kill innocent people, given that the US has long been, and continues to be, in the practice of killing innocent people.